While it’s unlikely that Jurassic Park and its cloned dinosaurs will become a reality any time soon, researchers did recently discover a 46 million-year-old fossilized mosquito with a meal of blood trapped within it. Although DNA did not survive, other blood components did, and so this highly unlikely discovery can help us better understand the fossilization process. 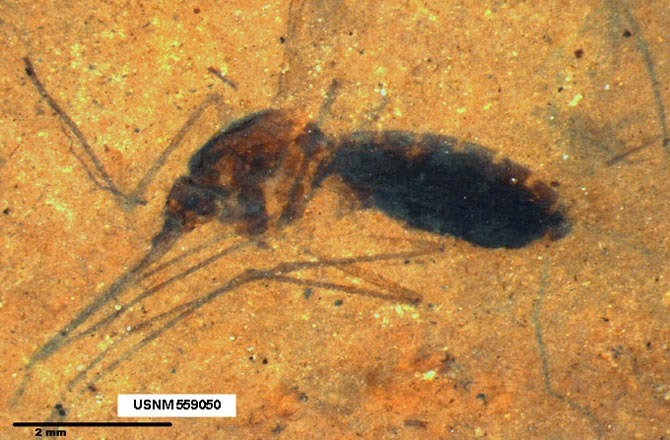 The fossil, found in shale collected from Glacier National Park in Montana, is impressive because nobody’s found a mosquito fossilized full of blood before. If a recently-fed mosquito dies, it’ll most likely disintegrate in its fragile, bloated state, before it can turn into a fossil. Researchers figured out that the mosquito had blood within it because they detected key blood components, specifically iron and heme. However, because the half-life of DNA is roughly 500 years (meaning that about half of its chemical bonds are broken every 500 years, depending on the exact conditions surrounding it), in this 46 million-year-old fossil there was no detectable DNA in the trapped blood. (But this doesn’t mean we might develop technologies in the future to figure out what that DNA originally looked like.) Even if we could decode the DNA, it still wouldn’t be dino-DNA, since the dinosaurs went extinct 65 million years ago – instead, it likely belonged to one of the many mammals or reptiles that were abundant during the Eocene epoch, 46 million years ago, in North America. So just remember – while a mosquito today might seem like a simple, irritating nuisance, it could be part of an important, future museum exhibit! « What Has Gene Therapy Done For You Lately?